Before I get to the visa application process, here’s some background about me and my circumstances: I am a Philippine passport holder, and have applied and received a visa from Australia before. I have a valid US Visa, with used tourist visas to Canada, Japan, and Myanmar. I also have more than 70 arrival and departure stamps from various countries, and that’s just in one passport. I am single and have my own company registered with the DTI. I have a bank account and a couple of credit cards, and I have two sisters who live in Australia, one of which is a temporary resident and the other a citizen. My intention to visit was for a short break from life in Manila, and to hopefully visit places I missed during my first two trips to the Australia. Step 1: Download and read the necessary pages, documents, and forms. This is very important, I can’t stress that enough. It won’t do to just ask questions without reading these web pages and documents first, because you’ll look like an idiot. Majority of your questions would likely be answered by the information written in these files. All these are available for download at the Australian Immigration website, immi.gov.au, and they are all free. There is no need to print all of those pages or forms (unless you prefer to read them off the computer), but the one thing you should print is the visa application form. It’s a fillable form, wherein you can type in your answers on the form itself and print it afterwards. If you use Adobe Reader to open it, it will not save the changes to the form, so fill it out only when you are ready to print and submit. However, if you’re using Foxit PDF Reader, it can save the changes to the form, so you can fill it out and edit it later on before printing. The Australian immigration require that all photocopied documents you submit are certified true copies. You can do this by going to the Notary Public. If you look at the form, it doesn’t list the birth certificate as part of the documents needed. I included it anyway, since I have an extra copy. Also, when I called to have my document picked up, they mentioned something about the NSO and I asked if I still need to get another since I already have a SECPA copy. They said I can include my copy instead of getting a new one. The NBI clearance isn’t really required either, but I included it since I have it anyway. I got it because it was required in the previous form, 48R. A medical isn’t required, but you may be required to get one if you are applying for a 6-month visa, or if you’re over 75 years old. The medical is only done through accredited clinics. From what I understand, you have to submit your application and use the reference code the embassy will give you when you go for your medical. I also included a cover letter [Download sample of intent letter] explaining the purpose of my trip and that I wish to get a multiple-entry visa, since I want to make a side trip to New Zealand. This isn’t really necessary, since the form now asks for your trip’s purpose. You are also asked to provide an itinerary of your trip, though you are not required nor advised to make any bookings until your visa is approved. The visa fee is AU$115, which is Php 5,100, based on the conversion rate at the time. Please double check the fees and the conversion rate, as this can change anytime. I bought my manager’s check from BDO, since I have an account there. Based on the comments in the previous blog posts, there are banks that would not let you buy a manager’s check if you don’t have an account with them. Best to call and inquire with the banks in your area if they’ll let you buy a manager’s check from them even if you don’t have an account. You don’t have to go to the embassy to submit your application. There are two ways to submit: you can either call the embassy hotline and have them pick up your documents or submit them in person at the VIA Center. I opted to go with the call center, since it was summer and don’t want to be away for too long from my electric fan. Calling the hotline costs Php 32 per minute, not including the charges from your network provider, if you are calling from a mobile phone. My phone call took about 10 minutes (which included a long wait for them to finish a spiel, and another wait for an operator to be available), and cost me Php 339.29. If you’re going this route, listen closely at the start of the spiel, because there is an option to skip that and go directly to request for a pick up. The courier fee for Metro Manila is Php 320, paid directly to the messenger who will pick up your documents. This fee covers both pick up and delivery after your application as been processed. VIA Center have offices in Makati and Cebu. Visa processing takes about ten days all the way to 30 days. I called to have my documents picked up on Tuesday, April 2, 2013. It was almost 5pm when I called, and was told that they have already reached the quota for pick up the follwing day. My documents were picked up on Thursday, April 4. I received a text from the embassy that my documents were received on Monday, April 8. By the third week of April, I was wondering what’s happening to my application. Someone who commented on my previous post said her application was received around the same time and she already has her visa. I started worrying when someone who submitted a week after I did said she already got her visa grant. That’s when I also found out that the embassy conducts phone interviews. Apparently, they don’t do this to all applicants, only for those they feel they need to clarify certain answers to the application form. Worry changed to distress when I missed not one, but FOUR calls from the embassy. The first call was to our house phone, and my sister gave them my mobile number since I was out of the house. The first call to my mobile came while I was struggling to get off a packed LRT, so I had to cancel it. The next two came when the phone was in silent mode because I was at an event. You can just imagine how frantic I was. I ended up calling the number, but it was the consulate’s trunkline number. I was told to just call the visa information number (845 9200). Because I do not know how to follow instructions, I called the hotline instead, and was told to send them an e-mail, which can be found on the immigration website. I sent an e-mail using the contact form there, and did not receive any response. On May 7, just a day shy of one month since they received my documents, I called the hotline again, after getting no response or call from the embassy. The operator took pity and gave me a number to contact, which is the consulate hotline. I wasn’t able to talk to anybody, but I did get an e-mail address. I sent another e-mail, which again did not receive any response. I finally got a text on May 14 that my documents have been dispatched to the courier for delivery. It did not mention if my visa was granted or not. My documents came the following day, and I was so relieved that my application was granted. It wasn’t a multiple entry visa, as I was hoping for. The visa was granted on May 10, and since it was a long weekend, it wasn’t dispatched until after election day. Unlike before, the embassy not just issue visa grant letters for tourists. You need to bring this when you leave Manila, as the local immigration would ask for your visa before they stamp you out of the country. 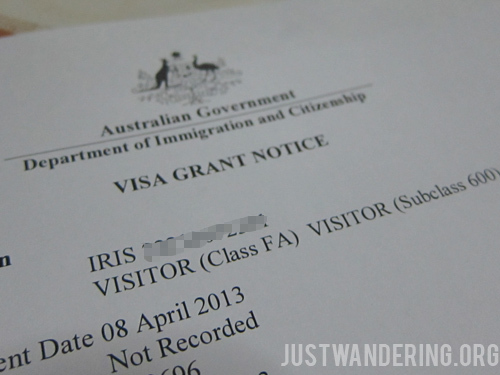 Also, instead of having a one-year validity, my Australian tourist visa is only valid until November 2013. I hope you find this helpful. I would also suggest you check the previous entries, How to apply for an Australian visa and Applying for an Australian tourist visa, because the discussions over there are a great resource, as it have inputs from applicants with different circumstances. You’re welcome to post your questions here, but please read the entire blog post and read all the documents I linked to before asking. Did you apply for an Australian tourist visa recently? How was your experience? Hello, what’s the best airline to use? Anybody here may flight on July16 bound to Sydney…via cebupac..??? Hi sis marich san ka sa syd? Hi sis Shane ask ko lang po English ba ang immigration officer if they ask about anything and what airline you use sis shane can you give me some tips about flight thanks for your help ..
Well sis.. mix nmn.. depend sa Immigration. .jetstar ang airline na book ni bf ko Sis… depend kong san ka Punta…ung ticket and passport and grant letter ang ipakita mo sa Immigration… ang tinanong nila sakin Bakit wala me return ticket sagot ko kasi balak magbakasyon ni bf sa pinas kaya dito na xa oz bibili ng ticket para sabay kami pabalik.. tapos pag sumagot ka wag u kabahan para wala ng maraming tanung.. tapos pina sulat nila sakin address and name ng fiance ko.. un lang sis. Thank you all so much for sharing your experiences and answering questions that I am not able to answer. I will be closing the comments section for this post, as it has already passed the 7,000 mark. Please continue the conversation over at my more recent entry, How to apply for an Australian Tourist Visa online.